31 May, 2017, New Delhi: A large number of Indians consume tobacco in some form or the other. India ranks at highest incidence of oral cancer in the world. In September 2016, the Supreme Court in a historic judgement made it clear that it has banned the sale of all forms of chewable tobacco and nicotine, and directed authorities to strictly enforce its directions. 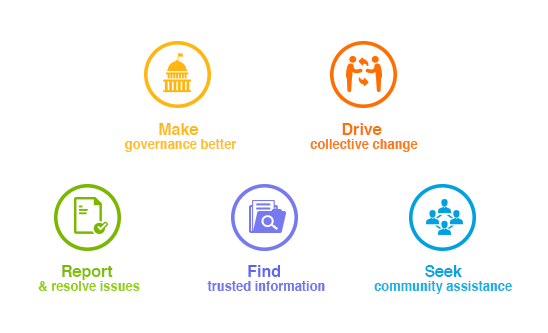 Citizen engagement platform LocalCircles ran a set of surveys across 18 states in India to understand if guthka and other chewable tobacco products were easily available in the cities. Out of the 10,143 responses, 86% said that they were easily available with a meagre 5% saying they were tough to find. 9% did not have an opinion on it. Supreme Court’s decision came almost 5 years after the tobacco manufacturers had found a way to overcome the regulation on chewable tobacco by selling pan masala and tobacco in separate pouches. The 2011 regulation 2.3.4 stated: “Products not to contain any substance which may be injurious to health: Tobacco and nicotine shall not be used as ingredients in any food products.” This meant a ban on all food products where tobacco is present as ingredient in the final product. While some states had issued orders to comply with the Supreme Court’s order, most of the states have still done nothing to enforce the ban. Out of the states where the survey was conducted citizens of Rajasthan, Uttarakhand, West Bengal, Jharkhand, Chattisgarh, Andhra Pradesh and Kerala said that the enforcement has not been effective at all in their state. Citizens of Punjab, Haryana, Delhi, Uttar Pradesh, Gujarat, Maharashtra, Odisha, Hyderabad and Karnataka said that the tobacco ban enforcement in their state has been poor. 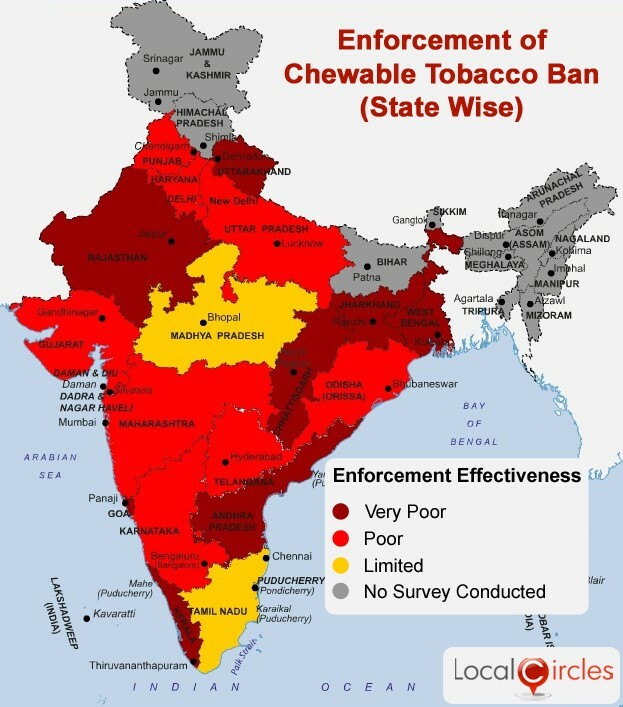 Turns out that only Madhya Pradesh and Tamil Nadu are two states where the effectiveness of chewable tobacco ban was somewhat visible. 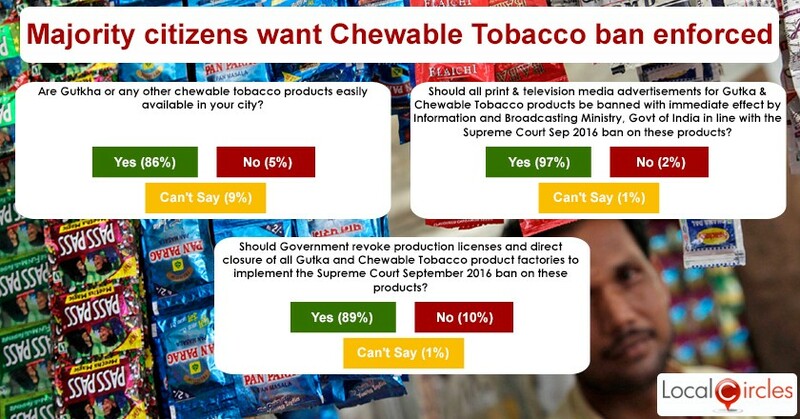 In a related poll, an overwhelming 97% of participants said that print and television advertisements of chewable tobacco products should be completely banned by the Ministry of Information & Broadcasting, in line with the Supreme Court’s order to ban these products. When asked if the government should revoke the production licenses and direct closure of all guthka and chewable tobacco product factories, 89% citizens responded in an affirmative. Only 10% said that it should not be done and 1% chose not to answer. Citizens also listed different ways in which the tobacco ban could be enforced. They suggested that the nodal central government agencies should ensure that all factories producing chewable tobacco in any form are shut down. They said that the agencies needed to work in very close coordination with state and other local authorities like police and health department to ensure that the ban is implemented.